A female DE15 socket (videocard side). The image and table detail the 15-pin VESA DDC2/E-DDC connector; the diagram’s pin numbering is that of a female connector functioning as the graphics adapter output. In the male connector, this pin numbering corresponds with the mirror image of the cable’s wire-and-solder side. A Video Graphics Array (VGA) connector is a three-row 15-pin HD-15 connector. 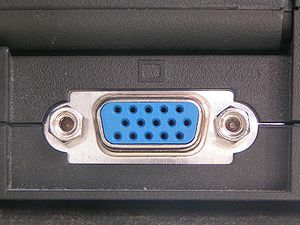 The 15-pin VGA connector is found on many video cards, computer monitors, and some high definition television sets. On laptop computers or other small devices, a mini-VGA port is sometimes used in place of the full-sized VGA connector. DE-15 is also conventionally called RGB connector, D-sub 15, mini sub D15, mini D15, DB-15, HDB-15, HD-15 or HD15 (High Density, to distinguish it from the older and less flexible DE-9 connector used on older VGA cards, which has the same shell size but only two rows of pins). 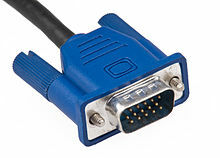 VGA connectors and cables carry analog component RGBHV (red, green, blue, horizontal sync, vertical sync) video signals, and VESA Display Data Channel (VESA DDC) data. In the original version of DE-15 pinout, one pin was keyed and 4 pins carried Monitor ID bits which were rarely used; VESA DDC redefined some of these pins and replaced the key pin with +5 V DC power supply. The same VGA cable can be used with a variety of supported VGA resolutions, ranging from 640×400px @70 Hz (24 MHz of signal bandwidth) to 1280×1024px (SXGA) @85 Hz (160 MHz) and up to 2048×1536px (QXGA) @85 Hz (388 MHz). There are no standards defining the quality required for each resolution, but higher-quality cables typically contain coaxial wiring and insulation which make them thicker. A quality cable should not suffer from signal crosstalk which occurs when the signals in one wire induce unwanted currents in adjacent wires, ghosting which occurs when impedance mismatches cause signals to be reflected (note that ghosting with long cables may not be the fault of the cable but may instead be caused by equipment with incorrect termination or by use of passive splitters), and other signal degradation effects; shorter VGA cables are less likely to introduce significant degradation. Some higher-end monitors and video cards featured 5 separate BNC connectors for RGBHV signal, allowing highest quality connection using five 75 ohm coaxial cables. There are HDMI to VGA and DVI to VGA adapters, and VGA to SCART converters. For a simple VGA to SCART adapter cable to be viable, the display card must have sufficient features. Namely the ability to provide interlaced output and adjust the frequency, number of total scan lines and number of visible lines (the actual resolution) to match those of the prevailing TV standard. Signal incompatibility rises from the fact that SCART uses composite sync, so either display card must be able to do so too, or sync signals must be summed with a simple circuit. Additionally some TV sets may require 1 volt voltage on SCART pin 16 as explicit signal to use component instead of composite signal. Likewise, three conductor analog RGB signal uses composite sync on green, but a converter circuit for to achieve that is simple as well. HDMI/DVI to VGA adapters do not carry the audio channel. Separate audio cables are used. HDMI to VGA adapters generally won't be useful as most displays can't read analog over the HDMI port. The display's EDID can still be read.